The Australian AIF Enlistment Poster measures 350mm wide x 500mm high and is printed full colour (CMYK) on 150gsm quality artboard ready for framing. These posters are hard to find (rare) and are in excellent condition making them a valuable collector's item. • Secure your piece of Australian War history! The Australian AIF Enlistment Poster is an Officially Licensed Poster. 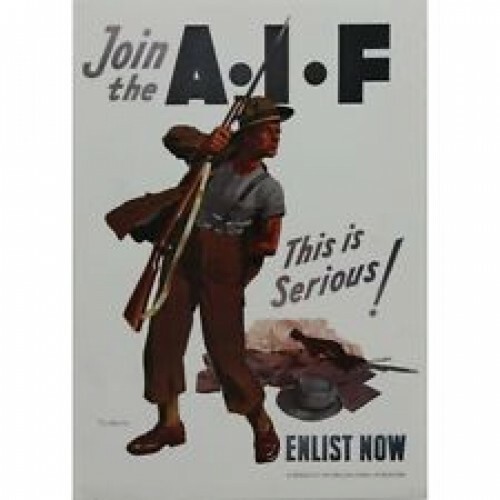 The Australian AIF Enlistment Poster measures 350mm wide x 500mm high and is printed full colour (CMYK) on 150gsm quality artboard ready for framing. These posters are hard to find (rare) and are in excellent condition making them a valuable collector's item. Features: • This is serious! AIF War Enlistment poster showing a young soldier dressing for war • Approximate dimensions 500mm H x 350mm W • Secure your piece of Australian War history! The Australian AIF Enlistment Poster is an Officially Licensed Poster.